Now they are saying that there head is WAY better then J/Ks P51... go to bottom of page & see chart. res0rli9 wrote: Now they or saying that there head is WAY better then J/Ks P51... go to bottom of page & see chart. I don't see it ... the graph shows it is about a wash.
AND, that engine was probably spec'ed to favor the AFR head. The engine appears to be the same configuration as used in the previous article were the 270's made 75HP more than unported SCJ's. "The 10.0:1 M-6007-521FT crate motor featured a stroker crank, forged pistons and rods, and a solid roller cam. ... the cam in the crate motor was upgraded to a healthier grind sporting a 0.780 lift (intake and exhaust), a 275/284-degree duration split, and a 110-degree (+5) lsa. Additional featured of the test motor included a Victor single-plane intake designed to accept a 4500 (Holley Dominator) carb, an MSD distributor, and a front-sump oil pan. For the initial test, the 521 crate motor was equipped with the as-supplied aluminum Super Cobra Jet heads. The Super CJs featured 290-cc intake ports, 72-cc combustion chambers, and a 2.20/1.76 valve combo. The test procedure was simple: Run the modified 521 first with the Super Cobra Jet heads then again with the new AFR 270s (with 72cc chambers). To ensure adequate airflow, the testing included a 1050 Holley Ultra Dominator carb. Equipped with the Super Cobra Jet heads and Edelbrock intake, the cammed 521 produced 652 hp at 6,500 rpm and 649 lb-ft of torque at 4,700 rpm. 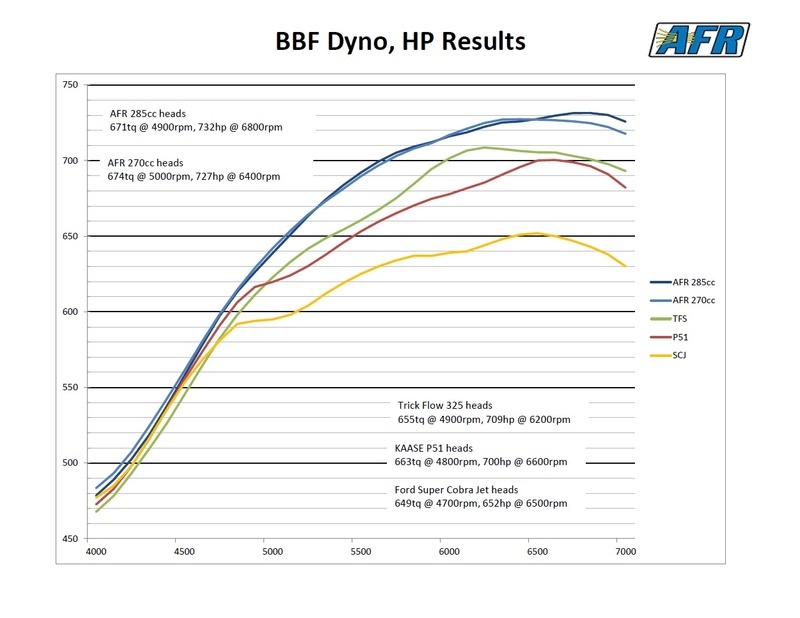 After the installation of the new AFR 270 heads, the peak numbers skyrocketed to 727 hp at 6,400 rpm and 674 lb-ft of torque at 5,000 rpm. Note that not only did the extra intake and exhaust flow offer more peak power (as expected) but the efficiency of the new design (bigger flow through a smaller hole) offered power gains through the entire rev range. " From all appearances, it was a pretty straight forward test. The cam used isn't a whole lot different than Kaase's spec cam for the P51's (273/280 degrees duration, 0.791/0.787-inch lift, and a 109-degree lobe-separation angle) used in this test: http://www.hotrod.com/articles/hemi-vs-wedge-shootout-jon-kaase-settles-one-of-the-most-fiercely-debated-topics-all-time-with-ultimate-dyno-test/ . If anyone feels it was unfairly biased, maybe they should do their own test, instead of calling the people who actually put in the work on this one liars. Interesting that nobody is questioning the Trickflow's performance. Have you had a chance to play with the 300cc ones yet? I didn't think the scj could handle .780 lift out of the box? I've sold some 300's, but have only built engines with the 270's and 285's so far. I don't necessarily buy into the bigger heads not being suited for a smaller (less than 500") motor. Boost / nitrous levels the playing field a lot more than it is given credit for IMO. I would like to see dyno comparisons between all 3 heads on the exact same shortblock. In both a 460" and mid 500" configurations. How would the a460 head look in this comparison? Darrin Gorham wrote: How would the a460 head look in this comparison? Really not a fair comparison, different type head. Quite a bit more compression, lower lift cam with close to the same duration as the cam in the other test. That was from 2006, I think the new as cast A460s are a little better. torino501 wrote: I didn't think the scj could handle .780 lift out of the box? That's correct. Won't get there with +.050" keepers either. Wonder how they did that? SCJ test was probably done with 1.5 rockers? But still its not believable unless there is a bias on the build for a favorable outcome. The comparison curve is probably more propaganda than anything. Case in point.. Does history show this much variation for TFS 325's and SCJ's? Comparing a CNC ported head to an as cast head is soooooo fair. How about a set of full boogie P-51s compared to the Big CNC heads for a fair comparison? Thanks Lem... thought I got kicked to the curb. was it bolt them on and run them ? How close did the manifold "match" each head..
Lots of details that could easily account for the difference in HP.. Agreed. Thats why I want to see the side by side comparison I mentioned. Give some REAL comparison numbers. those are the TFS powerport 325's full blown CNC deal. don't know how the stack up to the out of the box P51's though...? I see what your saying, but if you bought a set TFS max effort why not compare to a set of p51's or scj with all the bells and whistles. It completely depends on the rest of the engine. Really ... they are no different than any other company advertising their product with proclaims of testing it to be superior. Slanting the particular tests toward the benefit of their own product is just the way it is; whether it be auto parts or facial tissue. or tape or anything else. Take it all with a grain of salt and do your own testing. rmcomprandy wrote: Really ... they are no different than any other company advertising their product with proclaims of testing it to be superior. Slanting the particular tests toward the benefit of their own product is just the way it is; whether it be auto parts or facial tissue. or tape or anything else. I hate it when they do things like this because there will always be someone that will see this and take it as the holy grail. They had to see a need for the cylinder head and designed it to fit into a particular application. Why not tell everyone the reason behind you spending all the time and money bringing the product to market. I don't assume they are a Chinese company trying to undercut another manufacturer for a cheap dollar? If they just wanted to fill a hole in their product line it would have been a lot easier to buy the heads from another manufacturer and re-lable. I know this sounds to much like common sense.